With ever rising energy prices and the constant talk of peak oil, the future appears to be very grim. Entire segments of our society are so sure of the demise of modern life that they are already planning for a post-oil era – a time when energy is scarce and expensive. I hate to be the one to disappoint them, but while we are entering a post-oil era, it is not an era of scarcity. Just the opposite. Instead of reverting back to horse and buggy in the not too distant future, energy will become so abundant that the need for crude oil will go the way of the need for whale oil. How can I make such a fantastic claim, especially when all the facts seem to be to the contrary? The answer is simple – there are massive changes under way that will dramatically change the way we obtain, store and transmit energy. They are plain to see if you know where to look, but very few people are looking. Instead, they are focused on the old sources and paradigms. The new sources and paradigms are gaining steady headway and soon will overtake the old ones. When this transition occurs, it will be a surprise to almost everyone. If this idea seems too far fetched, remember that merely a few months ago, everyone was sure of global warming. Now that global warming is being exposed as just an elaborate hoax, remember that the status quo can change dramatically and quickly. By the time advent of cheap and abundant energy is noticed, it will already be in place. The act of noticing may be a rapid one. Cheap energy will not be the only change coming. Energy will become more personal and less centralized. People will be free from the tyranny of regulated power companies and having to live only where grid power is available. The third world will also benefit with millions having the blessings of electricity for the first time. Just as the industrial revolution created massive changes across America and Europe, the energy revolution will create beneficial changes for the whole world. When will this revolution occur? It is unfolding as I write. What is driving it? Human need and the creativity to meet that need. The Internet is the vehicle and individuals are the fuel. It is not coming from government research, although that may play a small part. It ultimately comes from the driving forces to meet mankind’s need for energy, and individuals working and collaborating to meet their energy needs. Best of all, you do not need to wait for it to come. It is here already and with a little ingenuity and work you can lay hold of it for yourself. Skeptical? Let us start with the change easiest to see. It will also be the most revolutionary – solar electricity. Solar electric you say? Since when is solar a cheap form of energy? Maybe you haven’t noticed, but the price has been dropping steadily every since solar cells were invented in the 1950s. For the first few decades only NASA could afford them. In the 1990’s the price was finally low enough for rudimentary cabin use. By 2000, you could power a small house with modest electric needs. Over the last several years, the price has dropped by two-thirds more. It is now actually cheaper than grid power. I bet you didn’t hear that announcement on the evening news, yet it reached this parity point silently in just the past year. You can now buy an entire system for your house that will pay for itself in only 14 years, and be guaranteed for well over 20 years. No one really knows the lifetime of solar panels, but in most cases, they will provide electricity for 30 years or more. Anything after the first 14 will be free electricity. Guess what else is going to happen? Solar electric is going to continue to get cheaper. It uses similar processes to computer chips, with even better and cheaper processes coming online. Just as computers drop in price every year, even as they get more powerful, so will solar panels. How low can they go? I suspect the price floor will be somewhere around the price of plastic – which comes to about $0.25 per watt. Of course as electricity gets cheaper, the price of plastic is likely to drop as well, so it may get cheaper than that. Parity with coal generated electric is normally considered to be around $1/watt, but for home generation, I think the parity price is higher than that. Including other system components with a 20 year life for the entire system, I calculate parity with $0.10/kwhr electric to be about $1.80/watt. Currently, you can buy solar panel for about $1.80/watt, or even as low as $1.00/watt if you catch a deal. You can even assemble your own panel from cells purchased on e-bay for around a dollar a watt. Even folks with modest means can now provide some of their own electricity for very little cash outlay. There are other energy technologies being developed as well. Micro-nuclear power plants for small communities are under development. These new plants are not the complex and dangerous behemoths of the past. They can be mass produced in a factory, are inherently fail-safe, and can be shipped on a truck to their final destination. Other technologies may also appear such as fusion breakthroughs, or other forms of natural clean energy. The last time anyone worked on alternative energy was in the 1970’s. There was no Internet, no computers, or many other modern technologies. Now thousands of individuals around the entire world are working together on problems, sharing their findings with others, and have vast new technologies at their disposal. What was formally unthinkable is now becoming possible. One such nuclear technology is based on Thorium fuel. It is four times as abundant as Uranium, has shorter lived nuclear waste, and reactors using it are inherently much safer. Best of all, it does not produce fuel for nuclear weapons, which is why it has probably never been developed. There is enough Thorium fuel to power the world for at least a thousand years. Generating power is not the only problem to be solved. Cheap energy is of limited value without a means to store it. In fact the Achilles heel of DIY (do-it-yourself) energy has long been the problem of storage. While the holy grail of a cheap high energy battery is still in the future ,this problem has been yielding to steady progress, and will continue to yield for the foreseeable future. Similar to solar cells, batteries have been around for decades. The lead-acid battery goes back almost a century. While their initial cost was lower than solar cells, their drop in price has not been nearly as dramatic. There are many reasons for this difference. One is the fact that they are more dependent on raw material prices than on manufacturing costs, so they won’t see the same price drop every year. An even bigger difference is the fact that until recently, there really wasn’t much of a need for a better battery. The old stand-by lead acid battery started millions of cars quite well each year, so there was no need for improvement there. Similarly, while carbon cell batteries were rather poor at powering toys and flashlights, the invention of alkaline cells solved those needs for decades until the invention of cell phones, laptops and digital cameras. Before they came along, Ni-cads had recently been invented, followed by Ni-MH and then Lithium-ion. Innovation won’t stop there either. There is a voracious need for even greater energy storage – not only for those devices but also for electric cars and home energy storage. New battery technologies are constantly being invented and other novel technologies such as fuel cells and ultra-capacitors are being researched to solve the energy storage problem. There is no predicting which of these technologies will finally provide dense, low-cost electrical storage, but with the fantastic pace of innovation and new discoveries in the material sciences, it will surely come. What can you use now for energy storage? For electric cars, unless you have deep pockets, you may have to wait a bit longer. Because of the pressing political and social pressure along with human need for electric vehicles, your wait will not be a long one. For off-grid home storage, the situation is similar. There are some strategies which I will lay out in a future article. For the on-grid home, an elegant and free storage solution is available now. It is the grid itself. 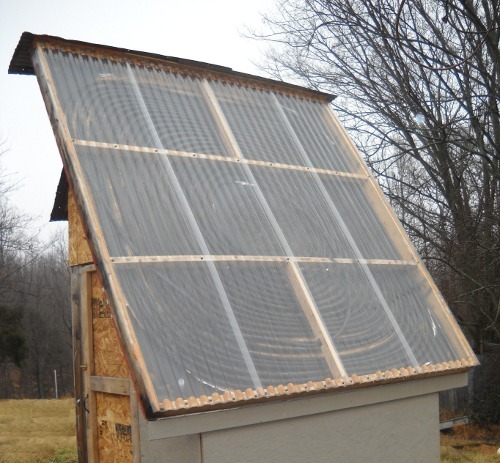 Most states now require power companies to allow you to tie into the grid with your own generation system via an ingenious device known as a Grid-tie Inverter. This device changes the DC electric coming from your solar panels into A/C electric that is phase-locked with your incoming grid power. It also has protection circuitry to drop the connection to the grid if it goes down in order to safeguard line workers who are assuming the lines are off. If you generate more power than you are consuming, your meter will actually spin backwards, with a credit going to your account for the electricity supplied. You are basically using the grid for a huge free storage device that is quite reliable as well. While many grid-tie inverters are quite expensive, cheaper ones are becoming available, and the costs should come down in time just like everything else energy related. Unlike conventional inverters, you can buy a smaller inverter now and add more inverters as your generating capacity goes up. What other technologies are coming? Inexpensive means for heating your home and your hot water are already here, and for DIY minded folks like ProvideYourOwn readers, you can save even more money by building the needed components yourself. Another revolution that is coming is a lighting revolution. This revolution using bright efficient LEDs will provide not only better, cheaper and more energy efficient lighting to the western world, but it will also safe, bright light to much of the third world as well. As these technologies develop and energy prices drop, we will cause dramatic changes across the world. How will they change? The poor of the world will have clean electric lighting for the first time. Currently unusable land will become viable for habitation and farming. Electricity will not be a problem, and neither will water. With cheap energy, desalination becomes affordable, even for agriculture. Even deserts will become inhabitable. Food production costs, directly related to energy costs, will plummet, making food even more abundant to a hungry world. Food can also be raised at significantly higher densities. Hydroponics, currently too expensive for all but premium foods like greenhouse tomatoes, will become feasible for arid or frigid areas where food must currently be imported. With abundant energy, many items will become cheaper. With lower costs for food, water, transportation and many other items, alleviation of much of third world poverty will at last be feasible. Only the pernicious threats of governments and wars to the poor will remain. There will be no doubt be other sea changes in our lives from cheap energy that we cannot now imagine. The future is indeed bright. We live in exciting times, do we not? The Coming Energy Revolution by Provide Your Own is licensed under a Creative Commons Attribution-ShareAlike 4.0 International License. This entry was posted in Energy and tagged energy, new energy, peak oil, solar. Sections: Article, Featured. Bookmark the permalink. Both comments and trackbacks are currently closed.